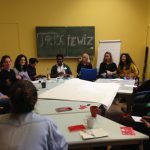 IntERAct – Interconnecting European Refugee Activists & Supporters (10/02/2018) – trixiewiz e V.
We were delighted to participate in the fascinating and successful international networking conference: IntERAct. We would like to warmly thank Solar e.V for organizing this event as well as all the participants who contributed through their engagement, experience, and knowledge. This exchange showed us how important and necessary it is to encourage a critical discussion of flight and borders within current European discourse. Among the crucial themes addressed were the differing perspectives on the enactment of migration law. In addition, participants discussed the conditions and implications of the EU’s measures and international agreements and the treaties regarding migration and flight. The major input and contribution from Trixiewiz related to empowerment, especially in regards to refugee women*. We greatly appreciated the opportunity to share our experiences and findings with others. During the discussion, a number of important questions were raised: What does empowerment mean for us and how do we mutually empower ourselves through the exchange of experiences and competencies? 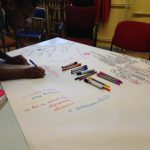 How do we interpret the concept of integration and how to we encourage/facilitate greater participation? What challenges do refugee women* in particular face? How do we build trust and how can we support and show solidarity with one another? The discussion gave us renewed motivation for our work. We hope to continue taking part in such opportunities and once again thank all the people involved. 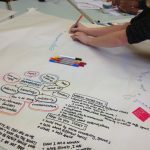 The recent immigration of hundreds of thousands of people to Europe has brought new perspectives on self-organization and empowerment to communities. Many progressive projects have been initiated all over Europe over the last few years. These initiatives are supporting, empowering, and fighting for better conditions and freedom for all people in and outside Europe. The networking conference IntERAct brought people together from various European countries. 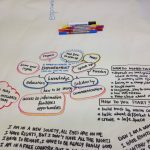 Over the course of more than ten workshops, political activists, empowerment trainers, NGO members, and voluntary supporters discussed current political realities. These topics ranged from the issue of violence against migrants to common European strategies in populist times to the new European border regimes and immigration laws. We also exchanged and discussed our differing approaches to self-organization, empowerment, and inclusion. 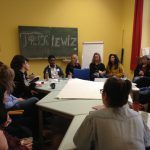 The IntERAct conference was embedded in the European training course “Refugees in Europe,” which was organised by Solar e.V., a Berlin NGO, together with five European partners. Under the slogan “We will rise,” the participants came together with the local partner, Trixiewiz e.V., to create new networks and engage more deeply in European exchange. We learned how refugees and migrant groups could focus on a common European struggle: United, we can learn from one another! United, we can fight together for refugee and migrant rights! After the discussion and exchange programme, we danced and celebrated our newly created connections with a diverse cultural programme. The conference meeting was mainly held in English, though we also organised whispering-translations as much as needed and possible. The conference was organised by the Solar e.V collective together with Trixewiz e.V. and other organisations. Entrance free – donations welcome.